This article is dedicated to a former client, Pete Beard. Pete was a man who developed a neurodegenerative disease almost as rare as his stellar personality and his fighting spirit. He was a proud man made frail by a cruel and obscure disease called Multiple System Atrophy. At our first appointment Pete gave me a bunch of pages he had printed from the internet to ensure I understood the complexity of his condition. “Most health professionals don’t know much about it” he said. “We need to raise awareness”. I’ll never forget the day Pete declared, with a weak quivering voice and through a mouthful of uncontrolled saliva, that he wanted to skipper in a yacht race in Nova Scotia before he died. It was a goal my good sense should have relegated to the ‘unrealistic’ basket. But I wanted it to be achievable, so I ignored my good sense. He needed training of his trunk and arm muscles, adaptive seating and modified controls. 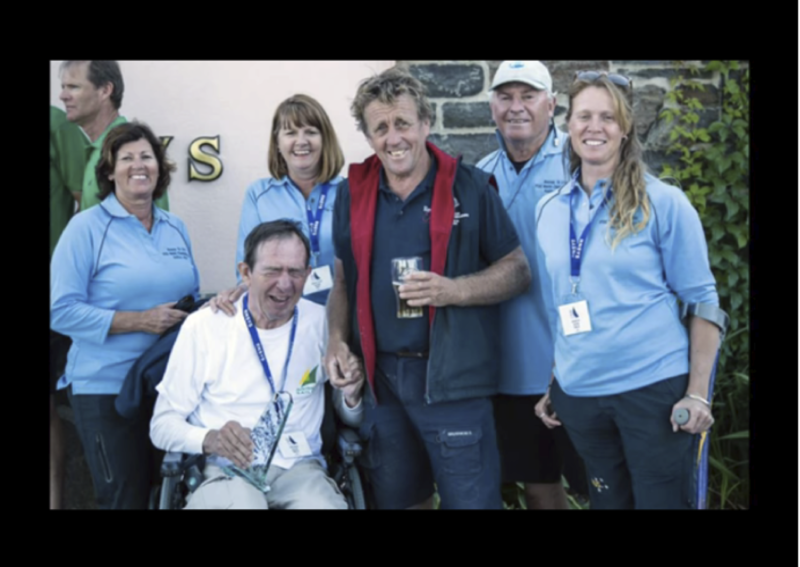 More importantly, he needed the unwavering support from his devoted wife Yve, his friends, and the good people at Sailability Queensland. The day that Pete skippered his yacht “Reason To Live” to victory in race 8 of the Disabled Sailing World Championships was probably the proudest day of his life. His face in this picture says it all. Pete was just 60 years old when Multiple System Atrophy took his life in July 2015, but it never broke him. You can watch a tear-jerking video of Pete’s life on his EVERYDAY HERO PAGE, and make a donation to UNSW’s much needed research into Multiple System Atrophy. Multiple system Atrophy is a terminal neurodegenerative disease that less than 1 person in every 166,700 people will develop. It doesn’t seem to be hereditary. Atrophy is the break down and shrinkage of cells. In MSA, the cells that shrink and break down are dispersed throughout multiple areas of the brain (mainly the basal ganglia, cerebellum and brainstem). As a result, multiple body systems are affected, particularly those relating to balance, movement and blood pressure. It appears to be associated with the presence of an abnormal protein within the cells called alpha-synuclein, however how the protein is introduced to the brain cells is still unknown. The symptoms of Multiple System Atrophy are often similar to those we see in Parkinson’s Disease. While Parkinson’s disease tends to inhibit a person’s expression of emotion in the face, many clients with MSA struggle to modulate or ‘hide’ their emotions. They can cry tears of joy at at time when they’d ordinarily just smile, and they might cry inconsolable tears of distress when they’d ordinarily just frown. When teasing out the symptoms to confirm a diagnosis, what differentiates the symptoms of Multiple System Atrophy from other neurodegenerative diseases like Parkinson’s Disease and MS is that it involves autonomic dysfunction which causes very unstable blood pressure. Usually, the blood pressure is too low, and drops suddenly and severely when upright. It can be sometimes be dangerously high when laying down. When investigating for MSA, a tilt table test is often used to explore a person’s blood pressure response to changing positions. It is a combination of symptoms, and a process of elimination, that leads to the diagnosis of Multiple System Atrophy. The age of onset of Multiple System Atrophy is usually in the 50s and 60s, although it has been identified in people in their late 30s. It is a terminal illness that tends to play out a course of approximately 6-10 years from diagnosis to death. How does a rehabilitation physiotherapist help someone with a terminal neurodegenerative disease? As with any neurodegenerative disease, physiotherapy can help to maintain balance, trunk stability, mobility, upper limb function and ultimately independence, for as long as possible. With strategic exercise prescribed by a physiotherapist, based on an assessment of the client’s impairments, an understanding of the progression of the disease and an appreciation for individual quality of life goals of the client and their carer. Physiotherapists can also help with airway clearance in cases where a client aspirates on their saliva, and breathing exercises to optimise lung function. When the a client’s posture is affected by MSA the physiotherapist’s skills can be utilised to assist with massage and maintenance of joint range of motion for pain management. We can recommend and trial the most suitable mobility aids. We train the client and their carer in the best methods for transferring in and out of bed, between chairs, down stairs, into cars, end even onto airplanes and yachts. Recently the Multiple System Atrophy Trust published a guide for physiotherapists working with clients with MSA. Rest in Peace Pete Beard.